Here are some pros and cons regarding the different kinds of chinking and caulking products to choose from for your home. 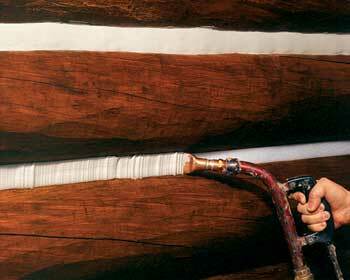 Caulking and chinking are among the final products that go into a log home. And they're among the most important. They not only seal air leaks and keep out rain, they help protect the home from uninvited guests, including insects and decay. But caulking and chinking will only work well if you choose products that are appropriate to your home's design and compatible with the finish or preservative on the logs. To make the right choice, you first have to understand how caulking and chinking differ. Caulking and chinking are part of a family of products called sealants. All log homes need some amount of caulking — you should caulk between log courses, at corners and around windows and doors. Caulking comes in different textures and colors that blend in with the stains used on the logs so at a distance it is nearly invisible. Whether a home needs chinking depends on the log profile or building system you choose. It is required between log courses on homes that are designed with a horizontal gap between the logs. Chinking is clearly visible on the surface of the log walls and is both decorative and functional. It is particularly popular with log home owners who want their home to have a historic look. As you weigh which of these products you need, be aware that the sealant you choose also must be compatible on a chemical level with the stain, preservative or other product you apply to your logs. For example, if you try to apply a water-based chinking on top of an oil-based stain, the chinking may not adhere. Also, not all brands of sealants and finishes will be compatible with each other. If you prefer to mix products from different manufacturers, first check with the manufacturers. Often they maintain lists of competitors' products that are compatible with theirs. If you aren't sure your products will work together, call the manufacturer directly and ask. Five kinds of caulk are used in general home construction — acrylic, butyl, oil-base, silicone and urethane. Those created for the log home industry usually are acrylic (water-based) or urethane-based. These two varieties have very different properties and application requirements. Some caulks can be applied before staining and they remain unaffected by the stain. Other caulks can be applied to a stained home within a matter of days. Still others have to be applied long after the stain has cured — up to a year in some instances. Again, you'll need to consider a strategy when selecting your sealing products and the order in which they should be applied to your home. Pros: Environmentally friendly. Will set up in one to four hours. Resistant to ultraviolet rays. Compatible with a variety of stains and preservatives. Comes in a variety of colors with a lifetime warranty. Clean-up is easy — just use soap and water. Cons: May not adhere well if it rains within one to four hours after application. Dries quickly under hot sun, making it hard to tool into place. (You may need to hang a tarp on the south side of the home to protect against sunlight when applying.) Works best if applied when temperature is between 40 and 90 degrees. Paint and stain may not adhere to it. Pros: Un-affected if it rains shortly after application. Instead, the rain actually helps the caulk skin over and set up. Cures even in low temperatures. Can be painted, stained or sanded. Also more pest- resistant than water-based caulks. Cons: Smell may be offensive to some. Not compatible with some preservatives, stains and finish coats. Must use mineral spirits for clean-up. Not as environmentally friendly as water-based. In pioneer days, wide bands of chinking were strictly functional, as the logs only interfaced at the corners and chinking was used in between to keep Mother Nature at bay. Primitive chinking was just about any material people could stuff between logs to keep out wind and rain, though often people used clay mixed with straw. More recently mortar or cement was used, but this performed poorly because it pulled away from the logs once it hardened. Thankfully, modern chinking products perform much like caulk does. They remain soft and pliable for years after being applied. Modern chinking also has excellent adhesion, flexibility and durability. And it preserves the home's seal. Chinking products can be used on both the interior and exterior sides of your wall system. But like caulk, chinking products may need maintenance and reapplication over time. Chinking is best done after you've applied other finishes. It is always best to use chinking and stain from the same manufacturer to ensure they are compatible with one another. Most chinking products are acrylic-based. Pros: Quick and easy for a do-it-yourselfer to apply to a home, especially if you buy five-gallon pails of chinking and then use a bulk-loading gun. Cons: Application equipment will cost $200 to $300. Chinking can blister if it is applied incorrectly, or if water vapor or sap are present in the wood. If it blisters, you'll have to re-apply. Because chinking fills wide gaps, you need to install a bond breaker between log courses before applying it.